Round slings are a type of sling. They consist of synthetic fibres and are suitable, for example, for lifting and transporting loads that have no attachment points of their own. DoForce 1 roundslings With continuous imprint of working load limit. The roundslings have webbed in stripes for each ton working load limit, one stripe per ton. Every roundsling is specially impregnated which makes it more resistant against abrasion and dirt. Supporting element is a high-end PES polyester fibre webbing roundsling endlessly folded. The working load limit grows according to the number of these fibres. Protective cover made of seamless woven impregnated polyester webbing for endlessly folded fibre webbing. Long-lasting marking on the protective cover: One woven-in bar for each ton of working load limit and imprinted working load limit on the other side. The relevant boundary and operating conditions should always be considered in choosing the correct round slings. Temperature or contact with (chemical) substances can in some cases significantly reduce the service life and durability. What advantages does the use of round slings offer? What is the meaning of the colour of the round sling? A uniform DIN EN colour code is prescribed for round slings. Dolezych round slings with the same working load limits therefore also have the same colour. For example, round slings with a working load limit of 1000 kg / 1 t are violet in colour, those with 5,000 kg / 5t are red and those with 8,000 kg / 8 t are blue. From 10,000 kg / 10 t the uniform colour code for all working load limits is orange. What disposal criteria apply to round slings? Round slings should be inspected regularly in order to ascertain the replacement state of wear in good time. Damage to the selvedge or the fabric and large numbers of yarn breakages, e.g. more than 10% of the entire yarn count in the most damaged cross-section or the strap surface (setting down sharp-edged loads), if large areas of the warp (longitudinal) threads are severed. 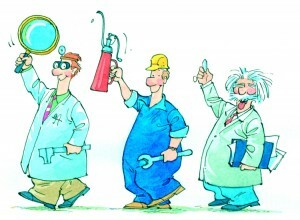 DoWeb has established itself by years of practice. Whenever a textile lifting device has to work under extremely difficult conditions, it has won its excellent standing. 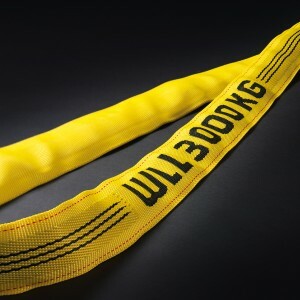 The slim and abrasion-resistant cover roundsling, the working load limit mark which is woven in on one side in addition to the bar code and the low tendency to wrinkle makes DoWeb a roundsling with very long service periods..
Top-class roundslings with woven-in working load limit specification DoPremium-Roundsling results from optimizing all available qualities concerning abrasion resistance, widths, tearing resistance, wrinkling tendency, service periods and safety coding The roundsling cover of the well- proven DoWeb has been developed even further. The improved webbing design now offers more protection against abrasion and improves handling as the wrinkling tendency has been reduced to a minimum. According to the standard, a roundsling has to be disposed of if the cover is damaged in such a way that the folded fibres can be seen. 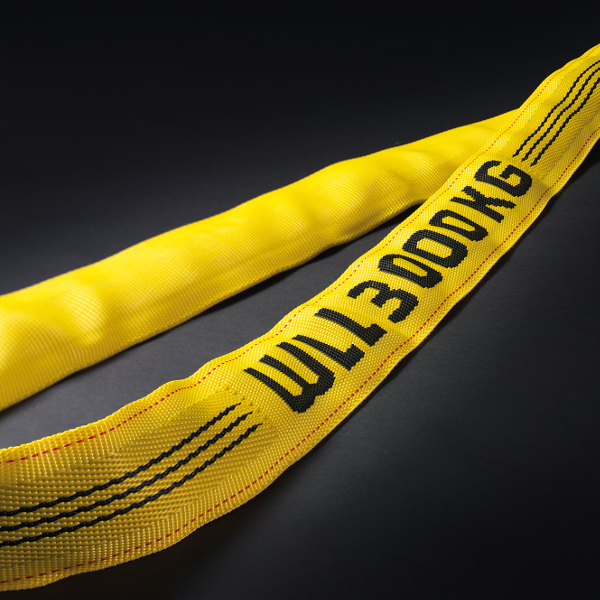 Compared to other roundslings the DoPremium quality offers longer service periods as the thickness of the cover can be compared to the one of a web sling. The DoPremium roundsling has, in addition to the bar code (1 bar for each ton of working load limit), a woven-in working load limit mark. This can smoothly glide over angular loads. The mark can not rot or wear off. In addition to the compact design, the optimized supporting width under the load and a premium design distinguish these top-rate roundslings. With the new DoPremium, we offer a product which unites all characteristics of a robust and conforming to safety regulations high-value lifting device. It can really be called a “supersling”. New technology for even more safety! We produce heavy load roundslings up to a carrying capcity of 100 tons in all lengths. 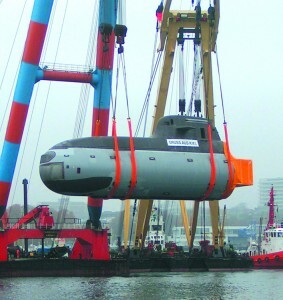 The advantages for the lifting of heavy loads are obvious: Compared to chains and ropes, a low own weight, especially protecting sensitive good In the higher weight range, DoMega roundslings should be equipped with sharp edge protection if the loads are very angular or if they have sharp edges. Colour Item no. WLL in kg single min. effective length mm. When Lifting Slings with extrem high carrying capacities are needed Roundslings made with Dyneema® (UHMW-PE) are the best choice. Through this high performande fibres an own weight reduction of 60% is achieved. 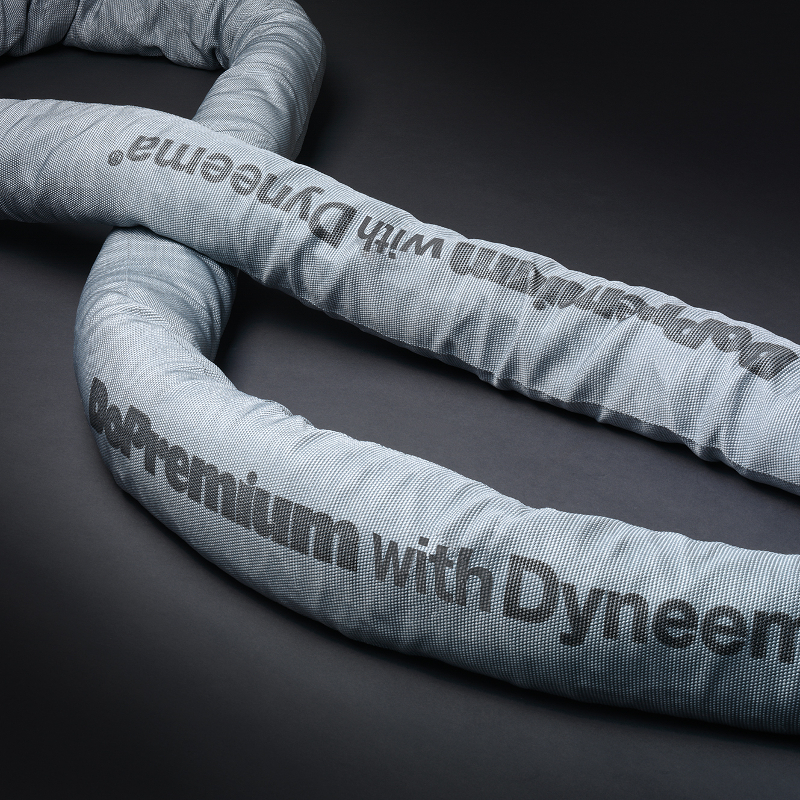 The lower Elongation of Dyneema® in comparison to Polyester-fibres leads to an improved dimensional accuracy. This becomes relevant when Lifting asymmetrical loads. On request, DoPremium round slings made of Dyneema® are also available with a round sling hose made of polyester (orange). 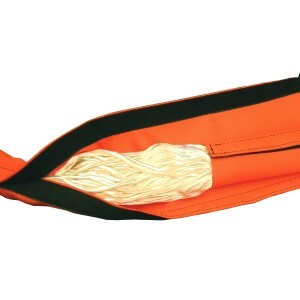 This combines the advantages of the low dead weight and the slender design due to the Dyneema® fibres with the inexpensive polyester protective sheath. This version is advantageous when no special cut-resistance is necessary. Haven´t found the right product, yet?